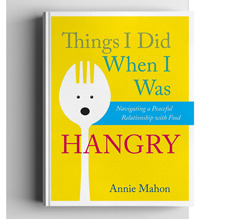 Dear Friends, Last week, as I was diligently writing a review on Goodreads for a friend's new book, I decided to see whether my book (Things I Did When I Was Hangry) had any new reviews. I noticed one of the new reviewers (we'll call her K.) gave the book only two stars out of five and had written a rather long rant. It began with a bang: "This is going to sound extremely judgmental, but this woman is a hot mess and I don't know why anyone would take advice from her." Sitting alone at my desk, I immediately felt flushed and embarrassed. K. was outing me on a public forum with literally 50 million members! Given that my book is jam packed with confessions of my most awkward moments, big and small, shame seemed a little unlikely. But sharing my own messiness felt easier than having this total stranger remind the whole world about it. K.'s four paragraph review ended with her acknowledging my book was an "interesting read-- but not in the way I think she was intending!" After reading it through, in an attempt to uplift myself I thought, "Well at least she didn't disparage my writing, just my life." As her words sunk in, I realized she was right, I am a mess. I am never in a holding pattern of happiness, ease or rest. I'm always randomly and rapidly moving in and out of feeling like I've got it all together. That's because no mental state, including happiness or orderliness, is durable. And this insight is the foundation of my teaching and the deeper thesis of my book, which on the surface is about my journey with mindful and unmindful eating. K. had inadvertently confirmed just what I'd been trying to express. The first thing the Buddha taught after his enlightenment was the unshakable truth that life will throw us difficulties no matter who we are, where we live, or even how diligently or wisely we practice mindfulness. We will never be someone who doesn't get angry, who doesn't have conflict, and who cries at all the "right" movies. Believing that we can be anything other than a hot mess is what actually causes us the most suffering. When I speak to groups of high school students, I see this pain reflected in their faces and their answers to questions. What are your goals? "To be as successful as my parents." "To get accepted into a top rated college." And, though they don't say it openly: "To look good." And how many of you have suffered with anxiety that disrupted your life over the last year? More than half of the students, men and women, always raise their hands. We believe that when we have the diploma, the job, the body, the partner, or we have written the book, we will reach a kind of plateau of life where we won't be as challenged as we are now. We won't be a hot mess anymore. K. clearly believed it. I often believe it. This belief underlies our culture and directs our lives. The very process of striving to find a resting place on solid ground is what gobbles up our mind space and energy and leaves us too drained to enjoy the messy moment we are actually living in. Accepting and really grokking that we will never live on dry ground is the closest we can get to enlightenment, what I like to call imperfect enlightenment. This insight frees our minds to be able to be more present to what we are actually doing and gives us compassion for the rest of humanity slogging through the mud right along side us. Going through the mud is going to get us messy. If we stop worrying about getting dirty and stop trying to get out clean, we can experience and accomplish more in the mud puddle of life. So while some part of me is not thrilled that K. is out there reminding people about my imperfection, another part of me is glad to shine the light of mindfulness on the mess. And, I'm hoping that if you see that it's not so bad, you might just be willing to roll around in the mud with me.